Problem: A widow was left with a 640 acre ranch and equipment. She had decided to move out of state to be closer with her grown children, grand children and had purchased another home in that state. The sale of the property in a timely manner would ease the burden of having a sizable property to manage in another state along with the carrying costs of owning the property. The widow wanted to achieve the true market value for her real property and personal property in a timely manner. 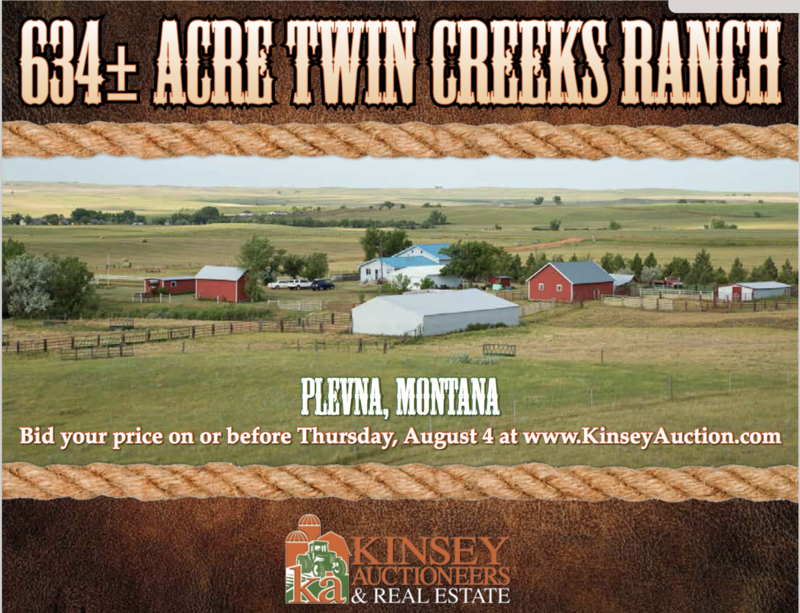 Solutions: Kinsey Auctioneers & Real Estate, LLC determined that a timed online only auction to facilitate a timely sale in an open and transparent forum at the sellers’ terms ($10,000 earnest money and close within 30 days) would be the most efficient way to sell Twin Creeks Ranch. In order to maximize the final sale price to the estate the farm was offered in its entirety. Results: Exceeding the seller’s expectations the sale of the assets were impressive with a timely closing on the real estate. The widow was able to move on to her new life in another state. 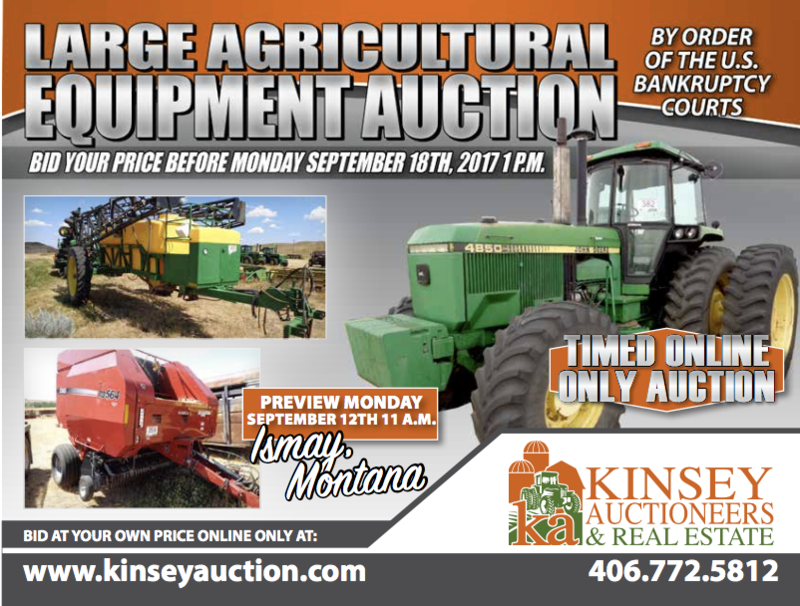 Problem: The U.S. Bankruptcy Courts had agricultural equipment that they received and needed to transfer the equipment into cash. Assets included, semi trucks, trailers, pickups, combines, swathers, balers, tillage equipment, campers, farm trucks, tools, welder, fuel tanks plus other assets. Items had to be moved off site to a secure location, cleaned and sold in a timely manner. Solution: Kinsey Auctioneer & Real Estate, LLC provided the courts with a solution of a timed online only auction to liquidate the assets in a timely manner and achieve the true market value. Assets were transported to an offsite secure location, cleaned, photographed, videoed , featured and sold on a online bid platform. 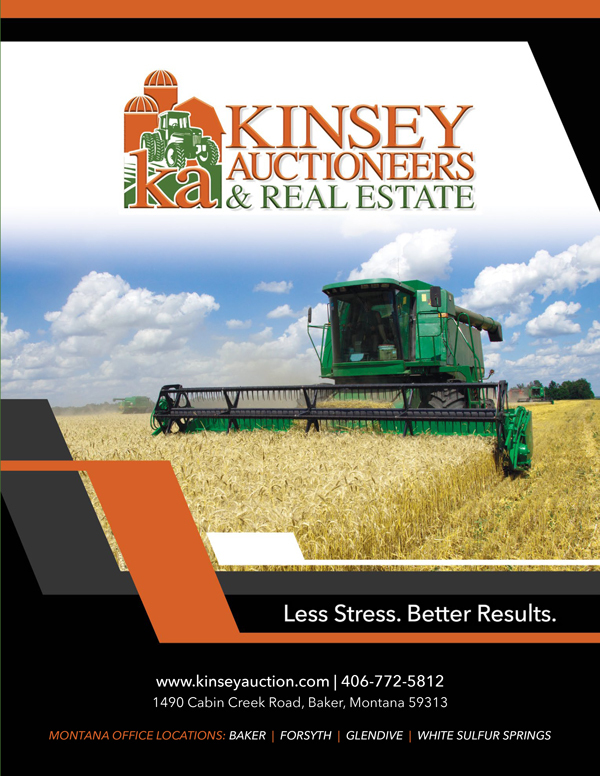 Results: The U.S. Bankruptcy Courts were quickly able to liquify their agricultural assets into cash with the solution that Kinsey Auctioneers & Real Estate provided. The timed online only auction met or exceeded the sellers projections with great success.